In February, 2015 co-owner of Martial Arts for Life, Mrs. Michelle Brugger (who was several months pregnant at the time) traveled to the set of “Life & Living” to talk about the importance of Organ & Tissue Donation. As a tissue recipient, she has spoken numerous times at the NJ Sharing Network in New Providence NJ and also at the Musculoskeletal Transplant Foundation in Edison, NJ. 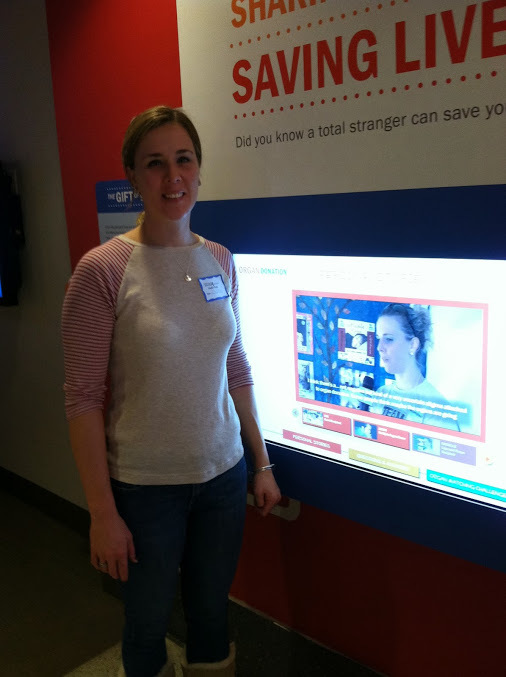 She has also been featured in the Sharing Network’s “Circle of Life” publication and their “Hero’s Corner” in The Bergen Record’s Newspaper in Education program. .
She was also featured in the Sharing Network’s interactive exhibit on organ and tissue donation and transplantation at The Liberty Science Center in Jersey City, NJ (see above). In June, 2015 as captain of Team Martial Arts for Life, she built a team of 145 members and raised $11,968 for the NJ Sharing Network 5k held in New Providence, NJ. In 2014, the team was 156 members strong and raised over $12,600. Team Martial Arts for Life has participated in the event since 2012 and has collectively raised over $37,000 for the Sharing Network Foundation and brought a total of over 500 team members to this charity event. She has made it her mission to spread awareness about the importance of organ and tissue donation.